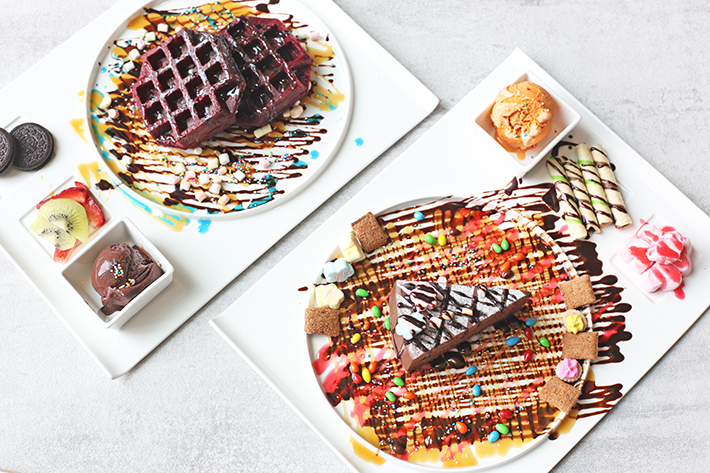 Located on the second storey of Orchard Gateway is Sugar Lips – a newly opened dessert parlour that specialises in over-the-top sweet treats. Quirky and whimsical, we did more than just a double take when walking past this dessert shop. 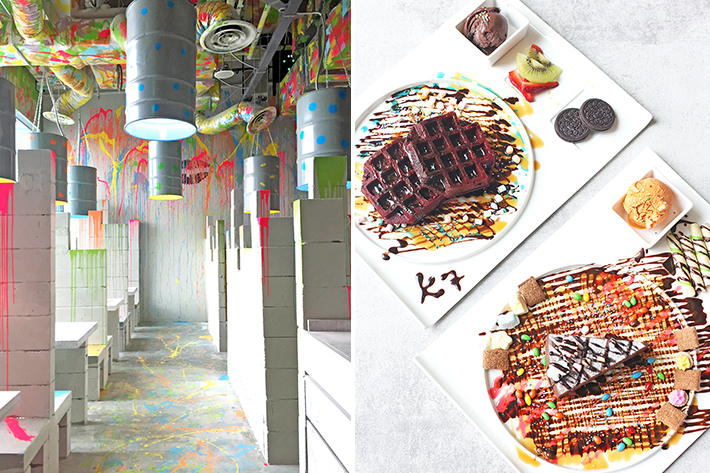 Colourful paint is splashed across the cafe’s concrete floors, walls and exposed pipes. So, is the food at Sugar Lips worth the damn calories or only worthy of a one-off visit? Read more to find out our verdict on this newest food and beverage addition to Orchard Road. The tables are divided by tall partitions and provide a great sense of privacy, hence making it a good spot in town for gatherings. Desserts are available in the following sizes – standard (S$12.90), medium (S$14.90) and large (S$16.90).A standard-size dessert comes with one topping, a medium-size dessert has two toppings while a large-size dessert is finished off with three toppings. Choose your desserts from 10 types of artisanal cakes and 4 different flavours of handcrafted waffles. A standard-size dessert comes with one topping, a medium-size dessert has two toppings, while a large-size dessert is finished off with three toppings. Choose your desserts from 10 types of artisanal cakes and 4 different flavours of handcrafted waffles. We went for the Red Velvet Fluffy Waffle and Chocolate Seduction Truffle Cake. 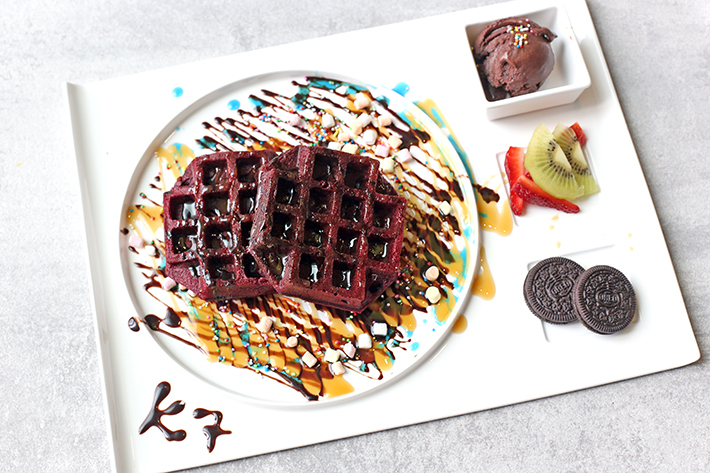 The former comprises octagon-shaped delightfully crisp red velvet waffles that are pillowy inside, while the latter is a sinfully rich chocolate cake alternated with generous amounts of chocolatey mousse.Surprise, surprise! These wacky-looking inventions were actually very satisfying and filling. Surprise, surprise! These wacky-looking inventions were actually very satisfying and filling. The toppings were decided by the staff and we weren’t given the option to choose. Oh well. They range from chocolate coated sunflower seeds, hundreds and thousands, sliced fresh fruits, Oreo biscuits, marshmallows, strawberry sauce, Thai milk tea ice cream and wafer rolls… Pretty much everything sweet. While we definitely would not proclaim Sugar Lips as a destination worth making a special trip for, we reckon it makes a great hangout spot to unwind over desserts if you already happen to be in town.